(Certifiable Hedgetrimmer)Those of you who know me will be well aware that I have for years been complaining to BW about the state of the vegetation along the canal channel, especially the trees and bushes that overhang from the offside, restricting the width and blocking sight-lines for boaters. Well, I opened my mouth once too often, last year! The result was in effect a challenge from John Dodwell, one of the trustees of the new Canal & River Trust, to get a team from FoR out as volunteers to tackle some of that intrusive growth.The result, after a lot of negotiation with the powers that be in CRT and our local waterway supervisor, an old friend of mine by the name of Lee King (! 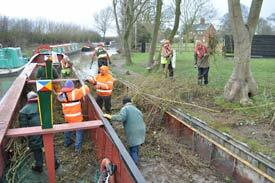 ), was a work party at Braunston on Saturday March 9th. Arranged in cooperation the Braunston Canal Society, six of our members turned out – Neil Hankin, Richard Scarff, Brian Seymour, Ray Robinson and myself – Nick Scarcliffe brought his brother Ben, another qualified tree surgeon, along, and Alan Andrews and Caroline Brudenell from the Blisworth Canal Partnership came along too. With Chris Burton and half a dozen of the BCS’s people, we used the Nutfield and a CRT work-flat to cut back the vegetation from opposite the Iron Bridge at the Marina entrance along towards the A45 bridge. 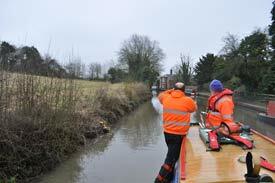 With people working from the flat or on the bank, the cut material was mostly passed over into Nutfield’s hold, and we made two trips to Braunston Turn where it was offloaded onto vacant ground by the sanitary station from where CRT staff will dispose of it. More than two-thirds of the length available was cleared of all overhanging vegetation, and several unstable, rotten trees were taken out completely. A good day’s work, of benefit to all boaters – and it might stop us all scratching our cabinsides in this June’s boat parades! This might seem a long way from the stated aims of FoR, but the voluntary support of the new ‘owners’ of the waterways is valuable PR for us, and the spirit of cooperation on the day between us, BCS and Blisworth CP members, and the CRT men on the ground was most enjoyable and effective. And anything we can do to improve the state of the canals, however small it may seem, will help to maintain their enjoyment by all and sundry. The day went without any problems, I don’t think anyone had to be reminded about working safely with all the powered equipment there was about and I saw no one taking unnecessary risks of any sort. It made me personally proud to be associated with such a great gang of workers. John (Highmore, of the CRT) and I have discussed in the past a situation where we are not just individual groups working with the same aims but isolated from each other. 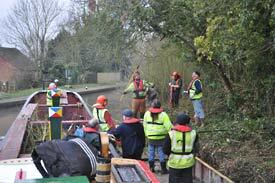 After the Stoke Bruerne meeting last year we said how good it was to see the interaction between the different groups. Yesterday saw three different groups, all with different skills, working together in close proximity without any worries about communication or performance. I know we could not have achieved what we did without this linking up of the three groups, and in turn the help and assistance of all involved at CRT.